My love for flavored water really blossomed when I discovered non-carbonated flavored waters. I cannot remember the first kind of water I tried but I do remember thinking that it was sooo wonderful to be able to enjoy some sort of flavored beverage without all the carbonation. As a wife and mom I am also always looking for new things for my family to drink that are actually good for them. So many things on the market today are full of junk...it's no wonder people are getting sick and are un-healthy, overweight and struggling emotionally. Eating good has such an effect on our health. If more people realized that I am sure we would have a healthier world in which to live!! Today, I am going to introduce you to a company that I have heard of before, yet had never tried. Honestly, I had heard that their waters were yucky and really not that good so I, naturally, kept my distance. Then, one day I decided to actually try it and am here to tell you today that I was VERY surprised that I LOVED the water that they make! The Herbal Water story begins in the spring of 2005, in the garden of Dr. Ayala. A passionate cook, trained pediatrician, talented artist and lifelong vegetarian, Dr. Ayala has spent years exploring healthy, tasty ways to feed children and adults. Seeking an alternative to sugar-laden and artificially flavored beverages, Dr. Ayala created her own blends of herb-infused waters that magically satisfy thirst and restore the spirit. Among her family and friends, Dr. Ayala's herbal waters became famous for their uniquely refreshing tastes and aromas. Full of flavor yet free of calories, artificial sweeteners, and artificial chemicals, these naturally fragrant beverages evoke happy feelings, like a breeze in a sunny garden. The growing demand for these tasty herbal waters led Dr. Ayala to bring Ayala's Herbal Water to everyone. Ayala's Herbal Water is the first nationally available organically certified enhanced flavored water made with all organic ingredients. 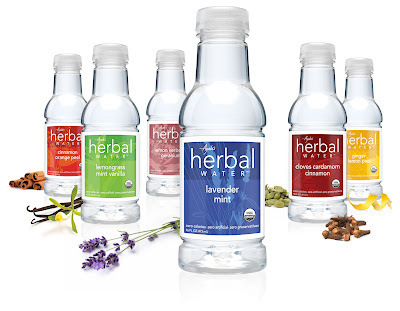 Each Herbal Water blend is all-natural and sets a new standard for healthy beverages: zero calories, zero artificial sweeteners, flavors, and colors, and zero chemical preservatives. And our water comes from an Artesian Well in Virginia. Nothing but great taste from pure water, infused with the finest natural herbs from around the world and kept fresh in a beautiful bottle for your enjoyment. I have found that flavored water is the ultimate in refreshment...especially on a hot summer day. Ayala's Herbal Water especially interests me because of the herbal properties it holds. Like I said before, I had heard of this company but was unsure if I would like their products. So, I welcomed this review with excitement and curiosity...for sure! I was skeptical, but decided that my daughter (who is a good taste-tester) and I would have a tasting party. We got out our special glasses, filled them with ice and began to taste our new waters! The first flavor we tried was the Lemongrass Mint Vanilla. I was really curious to see if Hannah would like it and wouldn't you know it...she DID! I found this flavor to be very lemon-y and totally refreshing. I really do love lemon so this was a lovely flavor for me! The Lemon Verbena Geranium was also yummy as it really favored the lemon flavor. I had a hard time getting past the Geranium part though...probably because my grandmother had some gorgeous geraniums and I never thought about eating them. Ha ha!! The rest of the flavors were surprisingly very good. I was definitely impressed with Ayala's ability to combine herbs into flavored waters...how ingenious! As I stated before, they have three new sparkling waters in the Cinnamon Orange Peel, Ginger Lemon Peel and Lemongrass Mint Vanilla flavors...and all of these sound amazing!! I would love to try them...most definitely! Ayala's Herbal Water can be purchased from their site, or you can go to their zip code locator to find a retailer near you. A 12-pack case retails for $24. Also, make sure you sign up for Ayala's Herbal Water's newsletter...when you do you will receive a special coupon! So, in my opinion...I am SO GLAD that I tried Ayala's Herbal Water! What a refreshing treat it was! My favorite flavor (Cloves Cardamon Cinnamon) was divine...and I know that I will be enjoying it in the future. Visit Ayala's Herbal Water, then come back here and leave a comment letting me know which of their products you would love to try. :) You do not have to be a blogger to enter, but you must have a valid email where you can be reached should you win. If you do not leave an email address, it must be where I can easily find it. This giveaway is open to US residents (lower 48 states ONLY) and will end 8/31 at 11:59 pm EST. The winner will be chosen using random.org and will be notified by email. The winner will have 48 hours to respond, or another winner will be selected. 1. "Like" Ayala's Herbal Water on Facebook. 2 entries, so 2 comments. 2. Follow Ayala's Herbal Water on Twitter. 2 entries, so 2 comments. Disclaimer: I received no monetary compensation for this post. I did receive 6 Ayala's Herbal Water products for review purposes. All quotes and stock photos are from the Ayala's Herbal Water website and email. All thoughts and opinions are 100% mine. I would love to try the cinnamon orange peel. I would like to try the ginger lemon peel....wonder if this would have been good for morning sickness. I would like to try the Ginger Lemon Peel water. I would love to try the Ginger Lemon Peel. I would like to try the sparkling Ginger Lemon Peel flavor! Thanks. I would love to try the Ginger Lemon Peel! I like Ayala's Herbal Water on FB! I follow Ayala's Herbal Water on twitter! 8/26 vote on Picket Fence blogs for you. I visited Ayala's Herbal Water and i would love to try the sparkling cinnamon orange peel and Lavendar Mint Water! I liked Ayala's herbal water on FB! I followed @HerbalWater on twitter! I followed My Opinion via GFC! I followed @coupons4moms on twitter! I would try the ginger lemon peel. 8/28 voted for you on picket fence blogs. voted for you on picket fence blogs 8/29. I would like to try the cloves cardamon and cinnamon. I follow you & Herbal Water on Twitter. I also follow them on Facebook. I would like to try the lemongrass mint vanilla. Cinnamon orange peel sounds delicious!! I'd like to try any of their sparkling herb infused waters. I've love to try the Lemongrass Mint Vanilla. I am a facebook fan of Ayla (Marysa N). I would like to try the Lavendar Mint Water.